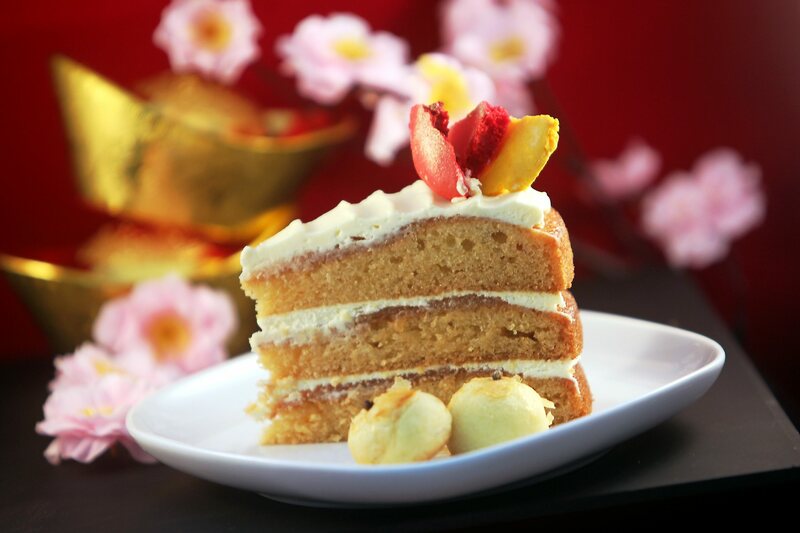 Having mastered her baking techniques in renowned French chef school Le Cordon Bleu, as well as founding the French-themed coffee shop Café Madeleine, Chef Alina Hew brings a refreshing French twist to this Jewel Cake recipe made from butter cake with pineapple jam filling. Beat butter and caster sugar until creamy. Add eggs one by one. Mix well. Add salt, vanilla extract. Add sifted flour and baking powder. Lastly, add cream. Mix well. Divide and pour mixture into three round 9in baking pans. Line the baking pans. Bake in pre-heated oven 175 degrees Celcius for 20mins or until done. Peel and grate the pineapples with manual grater. Cook grated pineapples with all the other ingredients in a heavy pot. Beat cream cheese and butter together. Mix sifted icing sugar until creamy. Place one of the three cakes on cake board. Spread the jam until it’s covered on the surface of the cake. Then spread the frosting on top. Continue to place another cake on top of the that cake. Repeat steps 2 and 4. The final step is to spread the frosting on the top most layer. Decorate the cake accordingly.